A tour de force for string programmers, offering game-changing levels of realism. Unprecedented realism and control for composers. Over a million samples provide both key and unexpected articulations. Build ensemble sizes from individually mic'd performers. Vienna Symphonic Library has been steadily forging an impeccable reputation for high quality orchestral samples. With advancing levels of addressable RAM through host workstations, affordable acres of hard drive space and, above all, demand from users, VSL's libraries have grown in size, increased in sophistication and closed the gap between 'the sampled thing' and 'the real thing'. VSL's latest project, Dimension Strings, brings the concept championed by last year's Dimension Brass to the string orchestra. This involves individual mic'ing of players, an interface packed with performance articulations and a collection of controls to drive these to great-sounding results. Dimension Strings will, this year, become a collection of Violin, Viola, Cello and Bass sections but, so far only the Violin and Cello parts are released. The price for the Standard Library, as it stands, is 595 euros and, once all four sections are complete, the price will be a fixed 1190 euros (or $1430). However, if you commit to buying the whole library now, it's yours for 795 euros via an Early Bird offer. Each part of the library is available as a download only, via VSL's own Download Manager application, which allows you to choose an install location, and delete download files once unpacked. Once complete, samples are structured and played back through VSL's free Vienna Instruments host. "Once the full library is complete, the sample count will top one million"
However, some features outperform the capabilities of this free software, so VSL recommend you buy Vienna Instruments Pro and, though you won't be pleased to have to find an extra 145 euros, we thoroughly recommend it too. 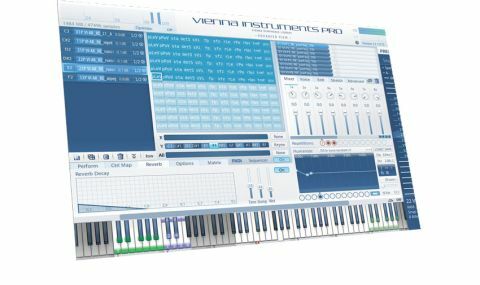 The programs created for it represent Dimension Strings' most powerful, including those utilising its internal sequencer, which drives ostinato programs, arpeggiated patches and musical scale runs. Dimension Strings is VSL's most ambitious undertaking to date; the Violin library alone contains 300,000 samples and, once the full library is complete, the sample count will top one million. This is in part due to the ways in which the new instruments have been captured. The Violin Library is formed of eight players, with the Cellos totalling six, and whilst the performers in these sections have been recorded simultaneously, they've been captured with individual microphones, meaning that, from Patch Level upwards, you can 'build' your own string orchestra. VI Pro then lets you blend the relative volume, pan (and more) of these to form the Ensemble group of your choice and, among other options, this means creating Divisi patches is straightforward. Equally, 'swelling' a small ensemble into a large one in real-time becomes possible too. So, if a database of eight individually assignable string players' performances gives you an insight into why the sample count is so high, the picture becomes fuller still when you realise that this is true across the full range of performance articulations - and multiple round-robin stages. "There are even sample programs with breathing, page turns and other 'real world' sounds which can be assigned to any player"
Expanding further, the VI Pro engine now extends to Humanize functions, meaning that the levels of realism can even be enhanced by deliberately slightly wonky tuning. Continuing in this vein, there are sample programs with breathing, page turns and other 'real world' sounds which can be assigned to any player. VSL have gone to great lengths to give users the same level of flexibility as conducting a real stringed orchestra. Orchestral stringed instruments, like guitars, have the capacity to continue playing notes 'higher' up an individual string than the note of the adjacent string. As an example, if playing a D major scale, you could switch to the A string having played D, E F# and G, or you could play the A, B, C# and D by continuing up the D string. As each string has its own sonic character, this is an important consideration and it's one answered by this library which offers Force patches (for both Violin and Celli) which keep the players' performances fixed on one string. As sustained programs are a boon for orchestral writers, these have been put under the microscope too. Dimension Strings provides three different approaches to Vibrato control through its Sustained programs now, all of which can be controlled readily through crossfades. Indeed, VSL has packed the interface with MIDI assignments, allowing you to assign your CC numbers of choice to key parameters, including Expression. "None of the existing VSL string titles match the sonic richness and flexibility of Dimension Strings"
This writer's been a fan of VSL's samples since they were first released but none of the existing VSL string titles matches the sonic richness and flexibility of Dimension Strings. The response time of the samples is dramatically improved. The preset Matrices of articulations are beautifully thought through, so if you simply want to fire up one of VSL's many Presets, no problem. Building your own ensembles is huge fun too, though, and just as composers carefully consider the ensemble groups of their works, so you can now too. We can't wait for the Violas and Basses.